Does Female Empowerment Promote Economic Development? With Michèle Tertilt (August 2018). Employment Protection, Investment in Job-Specific Skills, and Inequality Trends in the United States and Europe, with Ruben Gaetani (July 2018). Trends in Work and Leisure: It’s a Family Affair, with Titan Alon and Sena Coskun (October 2017). Distributional Effects of Monetary Policy, with Martin Schneider and Veronika Selezneva (September 2015). Colonies, with Andrea Eisfeldt (January 2007). Love, Money, and Parenting: How Economics Explains the Way We Raise Our Kids, with Fabrizio Zilibotti (February 2019). Bargaining over Babies: Theory, Evidence, and Policy Implications, with Fabian Kindermann. Forthcoming, American Economic Review. The Economics of Parenting, with Giuseppe Sorrenti and Fabrizio Zilibotti. Forthcoming, Annual Review of Economics. Women's Empowerment, the Gender Gap in Desired Fertility, and Fertility Outcomes in Developing Countries, with Michèle Tertilt. AEA Papers and Proceedings, May 2018. Clans, Guilds, and Markets: Apprenticeship Institutions and Growth in the Pre-Industrial Economy, with David de le Croix and Joel Mokyr. Quarterly Journal of Economics, February 2018. Money as a Unit of Account, with Martin Schneider. Econometrica, September 2017. Parenting with Style: Altruism and Paternalism in Intergenerational Preference Transmission, with Fabrizio Zilibotti. Econometrica, September 2017. The Baby Boom and World War II: A Macroeconomic Analysis, with Moshe Hazan and Yishay Maoz. Review of Economic Studies, July 2015. Gary Becker on the Quantity and Quality of Children, Journal of Demographic Economics, March 2015. Exploitation, Altruism, and Social Welfare: An Economic Exploration. Politics, Philosophy & Economics, November 2013. The Economics and Politics of Women's Rights, with Michèle Tertilt and Alessandra Voena. Annual Review of Economics, July 2012. Do International Labor Standards Contribute to the Persistence of the Child Labor Problem? With Fabrizio Zilibotti. Journal of Economic Growth, March 2010. Women's Liberation: What's in It for Men?, with Michèle Tertilt. Quarterly Journal of Economics, November 2009.
International Labor Standards and the Political Economy of Child Labor Regulation, with Fabrizio Zilibotti. Journal of the European Economic Association, April-May 2009. To Segregate or to Integrate: Education Politics and Democracy, with David de la Croix. Review of Economic Studies, April 2009. Occupational Choice and the Spirit of Capitalism, with Fabrizio Zilibotti. Quarterly Journal of Economics, May 2008. Humankapital, politischer Wandel und langfristige Wirtschaftsentwickung, plenary talk at the annual meeting of Verein für Socialpolitik 2007, published in Perspektiven der Wirtschaftspolitik, May 2008. Inflation and the Redistribution of Nominal Wealth, with Martin Schneider. Journal of Political Economy, December 2006. Aggregate Implications of Wealth Redistribution: The Case of Inflation, with Martin Schneider. Journal of the European Economic Association, April-May 2006. Dynamic Mechanism Design with Hidden Income and Hidden Actions, with Robert Townsend. Journal of Economic Theory, January 2006. The Macroeconomics of Child Labor Regulation, with Fabrizio Zilibotti. American Economic Review, December 2005. Child Mortality and Fertility Decline: Does the Barro-Becker Model Fit the Facts? Journal of Population Economics, June 2005. Social Class and the Spirit of Capitalism, with Fabrizio Zilibotti. Journal of the European Economic Association, April-May 2005. Show Me the Money: Retained Earnings and the Real Effects of Monetary Shocks. Recherches Economiques de Louvain, 1/2005. Accounting for Fertility Decline During the Transition to Growth. Journal of Economic Growth, September 2004. Public versus Private Education when Differential Fertility Matters, with David de la Croix. Journal of Development Economics, April 2004. Inequality and Growth: Why Differential Fertility Matters, with David de la Croix. American Economic Review, September 2003. Families in Macroeconomics, with Michèle Tertilt. Chapter 23 in Handbook of Macroeconomics, Vol. 2, December 2016. Culture, Entrepreneurship, and Growth, with Fabrizio Zilibotti. Chapter 1 in Handbook of Economic Growth, Vol. 2, December 2013. Intrahousehold Decision Making and Fertility, with Fabian Kindermann. Demographic Change and Long-Run Development, edited by Matteo Cervellati and Uwe Sunde, MIT Press, 2017. Growth Takeoffs, entry prepared for New Palgrave Dictionary of Economics, 2nd edition, May 2008. Origins and Consequences of Child Labor Restrictions: A Macroeconomic Perspective, with Dirk Krueger, published in Frontiers in Family Economics, edited by Peter Rupert, Emerald Press, 2008. The Economics of Motherhood, with Fabrizio Zilibotti, May 2018 (published in Princeton University Press Blog). Women's Empowerment and Development: The Family Connection, with Michèle Tertilt, October 2017 (published in VoxDev). Apprenticeship and the Rise of Europe, with David de la Croix and Joel Mokyr, March 2017 (published in Vox). Why European Women are Saying No to Having (More) Babies, with Fabian Kindermann, May 2016 (published in Vox). Tiger Moms and Helicopter Parents: The Economics of Parenting Style, with Fabrizio Zilibotti, October 2014 (published in Vox). Child Labor: Is International Activism the Solution or the Problem?, with Fabrizio Zilibotti, October 2009 (published in Vox). Europe's Fertility Crisis: Lessons From the Post-War Baby Boom, with Moshe Hazan and Yishay Maoz, September 2008 (published in Vox). Women's Rights: What's in It for Men?, with Michèle Tertilt, May 2008 (published in Vox). Politics and the Structure of Eduation Funding, with David de la Croix, September 2007 (published in Vox). The Research Agenda: Matthias Doepke on the Transition from Stagnation to Growth, April 2007 (published in EconomicDynamics Newsletter). Abstract: Empirical evidence suggests that money in the hands of mothers (as opposed to fathers) increases expenditures on children. Does this imply that targeting transfers to women promotes economic development? Not necessarily. We consider a noncooperative model of the household where a gender wage gap leads to endogenous household specialization. As a result, women indeed spend more on children and invest more in human capital. Yet, depending on the nature of the production function, targeting transfers to women may be beneficial or harmful to growth. Transfers to women are more likely to be beneficial when human capital, rather than physical capital or land, is the most important factor of production. We provide empirical evidence supportive of our mechanism: In Mexican PROGRESA data, transfers to women lead to an increase in spending on children, but a decline in the savings rate. Keywords: Gender Equality, Development, Marital Bargaining. Women's Empowerment and Development: The Family Connection (Published in VoxDev). A video of Michèle discussing the paper on VoxDev. Abstract: In recent decades, the correlation between U.S. men's wages and hours worked has reversed: low-wage men used to work the longest hours, whereas today it is men with the highest wages who work the most. This changing correlation accounts for roughly 30 percent of the rise in the variance of male earnings between 1975 and 2015. In this paper, we rationalize these trends in a model of joint household labor supply. Our quantitative model generates similar changes to what is observed in the data as a reaction to shifts in women’s education and labor supply, the gender gap, and assortative mating. Our model is consistent with the observations that the changing wage-hours correlation among men is driven by married men, and that there is little change in the wage-hours correlation among employed women and at the household level. The results suggest that taking into account joint household decision making is essential for understanding the dynamics of labor supply. Abstract: This paper quantitatively assesses distributional effects of monetary policy. We use a life cycle model with housing to compute the response of the U.S. household sector to an increase in the Federal Reserve's inflation target. We find than an increase in nominal interest rates generated by higher expected inflation has sizeable and heterogeneous welfare effects. Moreover, the responses of winners and losers do not cancel out; instead the policy announcement has persistent effects on aggregate consumption and house prices that propagate through the distribution of wealth. Keywords: Inflation, Redistribution, Monetary Policy, Housing. A discussion of the paper on nytimes.com by Binyamin Appelbaum: Ben Bernanke Says Fed Can't Get Caught Up in Inequality Debate. Mentions and discussions of the paper at other places: washingtonpost.com, aljazeera.com, bloomberg.com, wsj.com, hellenicshippingnews.com, indiatimes.com, NZZ, FAZ, CSPAN. Abstract: In many developing countries, the institutional framework governing economic life has its roots in the colonial period, when the interests of European settlers clashed with those of the native population or imported slaves. We examine the economic implications of this conflict in a framework where institutions are represented by the number of people with property-rights protection, i.e., "gun owners." In the model, gun owners can protect their own property, they can exploit others who do not own guns, and they may decide to extend property rights by handing out guns to previously unarmed people. The theory generates a "reversal of fortune" between colonies with many and few oppressed: income per capita is initially highest in colonies with many oppressed that can be exploited by gun owners, but later on excessive concentration of economic power becomes a hindrance for development. Keywords: Colonization, Property Rights, Slavery, Development. Abstract: It takes a woman and a man to make a baby. This fact suggests that for a birth to take place, the parents should first agree on wanting a child. Using newly available data on fertility preferences and outcomes, we show that indeed, babies are likely to arrive only if both parents desire one. In addition, there are many couples who disagree on having babies, and in low-fertility countries women are much more likely than men to be opposed to having another child. We account for this evidence with a quantitative model of household bargaining in which the distribution of the burden of child care between mothers and fathers is a key determinant of fertility. The model implies that fertility is highly responsive to targeted policies that lower the child care burden specifically for mothers. Keywords: Fertility, Bargaining, Child Care. Why European Women are Saying No to Having (More) Babies (Published on Vox). Proč ženy v Evropě nechtějí mít více dětí?. Kinder sind Verhandlungssache (Published on Ökonomenstimme). Interview with HCEO that includes a discussion of the paper: Matthias Doepke on Why He Studies Family Economics. An article in Diário de Notícia by Fernanda Cancio discussing the paper: Feminismo é bom para a natalidade. Other discussions of the paper: Quartz, Co.exist, Marginal Revolution, AEIdeas, HCEO, Observador, Sempre Familia, The Age, euro2day, obserwator finansowy, Sydney Morning Herald. Forthcoming, Annual Review of Economics. Abstract: Parenting decisions are among the most consequential choices people make throughout their lives. Starting with the work of pioneers such as Gary Becker, economists have used the toolset of their discipline to understand what parents do and how parents' actions affect their children. In recent years, the literature on parenting within economics has increasingly leveraged findings and concepts from related disciplines that also deal with parent-child interactions. For example, economists have developed models to understand the choice between various parenting styles that were first explored in the developmental psychology literature, and have estimated detailed empirical models of children's accumulation of cognitive and noncognitive skills in response to parental and other inputs. In this paper, we survey the economic literature on parenting and point out promising directions for future research. Keywords: Parenting, Parenting Style, Skill Acquisition, Peer Effects, Altruism, Paternalism. AEA Papers and Proceedings, 108, 358–362, May 2018. Abstract: We document evidence on preferences for childbearing in developing countries. Across countries, men usually desire larger families than women do. Within countries, we find wide dispersion in spouses' desired fertility: there are many couples whose ideal family size differs by five children or more. This disagreement between spouses suggests that the extent to which women are empowered should matter for fertility choices. We point to evidence at both the macro and micro levels that this is indeed the case. We conclude that taking account of household bargaining and women’s empowerment in analyses of fertility is an important challenge for research. Keywords: Women's Empowerment, desired fertility, marital bargaining. Quarterly Journal of Economics, 133(1), 1–70, February 2018. Lead article. Abstract: In the centuries leading up to the Industrial Revolution, Western Europe gradually pulled ahead of other world regions in terms of technological creativity, population growth, and income per capita. We argue that superior institutions for the creation and dissemination of productive knowledge help explain the European advantage. We build a model of technological progress in a pre-industrial economy that emphasizes the person-to-person transmission of tacit knowledge. The young learn as apprentices from the old. Institutions such as the family, the clan, the guild, and the market organize who learns from whom. We argue that medieval European institutions such as guilds, and specific features such as journeymanship, can explain the rise of Europe relative to regions that relied on the transmission of knowledge within closed kinship systems (extended families or clans). Keywords: Apprenticeship, Guilds, Dissemination of Knowledge. Apprenticeship and the Rise of Europe (Published in Vox). Discussions of this paper: NZZ (Link), Frankfurter Allgemeine Zeitung, naked capitalism, Northwest Citizen. YouTube Video (in German) of interview discussion of this paper. Econometrica, 85(5), 1537–1574, September 2017. Abstract: We develop a theory that rationalizes the use of a dominant unit of account in an economy. Agents enter into non-contingent contracts with a variety of business partners. Trade unfolds sequentially in credit chains and is subject to random matching. By using a dominant unit of account, agents can lower their exposure to relative price risk, avoid costly default, and create more total surplus. We discuss conditions under which it is optimal to adopt circulating government paper as the dominant unit of account, and the optimal choice of "currency areas" when there is variation in the intensity of trade within and across regions. Econometrica, 85(5), 1331–1371, September 2017. Lead article. Abstract: We develop a theory of parent-child relations that rationalizes the choice between alternative parenting styles (as set out in Baumrind 1967). Parents maximize an objective function that combines Beckerian altruism and paternalism towards children. They can affect their children's choices via two channels: either by influencing children's preferences or by imposing direct restrictions on their choice sets. Different parenting styles (authoritarian, authoritative, and permissive) emerge as equilibrium outcomes, and are affected both by parental preferences and by the socioeconomic environment. Parenting style, in turn, feeds back into the children's welfare and economic success. The theory is consistent with the decline of authoritarian parenting observed in industrialized countries, and with the greater prevalence of more permissive parenting in countries characterized by low inequality. Keywords: Parenting Style, Intergenerational Preference Transmission, Paternalism, Occupational Choice. Tiger Moms and Helicopter Parents: The Economics of Parenting Style (Published in Vox). A discussion of the paper on nytimes.com by Anand Giridharadas: Unequal Societies Give an Incentive for Pushy Parenting. An opinion piece by Pamela Druckerman on nytimes.com that cites the paper: A Cure for Hyper-Parenting. A discussion in Chicago Magazine by Whet Moser: Why Are Helicopter Parents So Intense? Maybe They're Scared. Fabrizio Zilibotti's honorary speech on 'Parenting with Style' at the XVI April International Academic Conference on Economic and Social Development in Moscow, April 15, 2015: Parenting Styles and Economics. A podcast with Fabrizio Zilibotti discussing the paper: The Macro and Micro of Parenting. A discussion in Les Echos by Jean-Marc Vittori: L'économie, les mamans tigres et les parents hélicoptères. A discussion on Slate (French site) by Alphonse Corone: Plus vous vivez dans une société inégalitaire, moins vos parents vous laissent développer votre imagination, et inversement (sauf en France). A discussion in La Repubblica by Rosaria Amato: Cosa rende i genitori severi o permissivi? La risposta degli economisti. A discussion in Dagens Næringsliv by Eva Grinde: Like, rike og uoppdragne. A podcast on Radio France by Charlie Dupiot: L'enfant optimiste. Mentions and discussions of the paper at other places: Washington Post, NZZ am Sonntag, Frankfurter Allgemeine Sonntagszeitung, El Mundo, Aftenposten, Yale News, Calcalist, metafilter.com, Greg Mankiw's Blog, nuzzel.com, econoGIST, smartweek.it, The Telegraph, World Economic Forum, Quartz I, Quartz II, Nada es Gratis, Cafe, Iconomix, Observador, El Confidential, Hoje em Dia, Marginal Revolution. YouTube Video of presentation of this paper at the Barcelona GSE Summer Forum. Published in Demographic Change and Long-Run Development, edited by Matteo Cervellati and Uwe Sunde, MIT Press, 2017. Abstract: The economic theory of fertility choice builds predominantly on the unitary model of the household, in which there is a single household utility function and potential intra-household disagreement is abstracted from. Empirical evidence suggests, however, that many (potential) mothers and fathers disagree on whether to have children, on how many children to have, and on when to have them. In this paper, we review existing work that brings models of intrahousehold conflict and bargaining to bear on fertility choice, and we point out promising future directions for this line of research. Keywords: Fertility, Bargaining, Child Care, Limited Commitment. Handbook of Macroeconomics, Vol. 2, 1789-1891, December 2016. Abstract: Much of macroeconomics is concerned with the allocation of physical capital, human capital, and labor over time and across people. The decisions on savings, education, and labor supply that generate these variables are made within families. Yet the family (and decision-making in families) is typically ignored in macroeconomic models. In this chapter, we argue that family economics should be an integral part of macroeconomics, and that accounting for the family leads to new answers to classic macro questions. Our discussion is organized around three themes. We start by focusing on short and medium run fluctuations, and argue that changes in family structure in recent decades have important repercussions for the determination of aggregate labor supply and savings. Next, we turn to economic growth, and describe how accounting for families is central for understanding differences between rich and poor countries and for the determinants of long-run development. We conclude with an analysis of the role of the family as a driver of political and institutional change. Keywords: Macroeconomics, Families, Households, Bargaining, Fertility, Labor Supply. Review of Economic Studies, 82(3), 1031-1073, July 2015. Abstract: We argue that one major cause of the U.S. postwar baby boom was the rise in female labor supply during World War II. We develop a quantitative dynamic general equilibrium model with endogenous fertility and female labor-force participation decisions. We use the model to assess the impact of the war on female labor supply and fertility in the decades following the war. For the war generation of women, the high demand for female labor brought about by mobilization leads to an increase in labor supply that persists after the war. As a result, younger women who turn adult in the 1950s face increased labor-market competition, which impels them to exit the labor market and start having children earlier. The effect is amplified by the rise in taxes necessary to pay down wartime government debt. In our calibrated model, the war generates a substantial baby boom followed by a baby bust. Keywords: Fertility, Female Labor-Market Participation, Baby Boom, World War II. Europe's Fertility Crisis: Lessons From the Post-War Baby Boom (published in Vox). How Rosie the Riveter led to the 1950s' Baby Boom. Journal of Demographic Economics, 81(1), 59-66, March 2015. Abstract: This paper reviews Gary Becker's contributions to the economic analysis of fertility, from his 1960 paper introducing the quantity-quality tradeoff to later work linking the economics of fertility to the theory of economic growth. Keywords: Gary Becker, Fertility, Quantity-Quality Model, Demographic Transition. Handbook of Economic Growth, Vol. 2, 1-48, December 2013. Abstract: We discuss the two-way link between culture and economic growth. We present a model of endogenous technical change where growth is driven by the innovative activity of entrepreneurs. Entrepreneurship is risky and requires investments that affect the steepness of the lifetime consumption profile. As a consequence, the occupational choice of entrepreneurship hinges on risk tolerance and patience. Parents expecting their children to become entrepreneurs have an incentive to instill these two values in their children. Cultural transmission is Beckerian, i.e., parents are driven by the desire to maximize their children's happiness. We also consider, in an extension, a paternalistic motive for preference transmission. The growth rate of the economy depends on the fraction of the population choosing an entrepreneurial career. How many entrepreneurs there are in a society hinges, in turn, on parental investments in children's patience and risk tolerance. There can be multiple balanced-growth paths, where in faster-growing countries more people exhibit an ``entrepreneurial spirit." We discuss applications of models of endogenous preferences to the analysis of socio-economic transformations, such as the British Industrial Revolution. We also discuss empirical studies documenting the importance of culture and preference heterogeneity for economic growth. Keywords: Culture, Entrepreneurship, Innovation, Economic Growth, Endogenous Preferences, Intergenerational Preference Transmission. Politics, Philosophy & Economics, 12(4), 375-391, November 2013. Abstract: Child labor is often condemned as a form of exploitation. I explore how the notion of exploitation, as used in everyday language, can be made precise in economic models of child labor. Exploitation is defined relative to a specific social welfare function. I first show that under the standard dynastic social welfare function, which is commonly applied to intergenerational models, child labor is never exploitative. In contrast, under an inclusive welfare function, which places additional weight on the welfare of children, child labor is always exploitative. Neither welfare function captures the more gradual distinctions that common usage of the term exploitation allows. I resolve this conflict by introducing a welfare function with minimum altruism, in which child labor in a given family is judged relative to a specific social standard. Under this criterion, child labor is exploitative only in families where the parent (or guardian) displays insufficient altruism towards the child. I argue that this welfare function best captures the conventional concept of exploitation and has useful properties for informing political choices regarding child labor. Keywords: Child Labor, Exploitation, Social Welfare Function, Altruism. Annual Review of Economics, 4, 339-372, July 2012. Abstract: Women's rights and economic development are highly correlated. Today, the discrepancy between the legal rights of women and men is much larger in developing compared to developed countries. Historically, even in countries that are now rich women had few rights before economic development took off. Is development the cause of expanding women's rights, or conversely, do women's rights facilitate development? We argue that there is truth to both hypotheses. The literature on the economic consequences of women's rights documents that more rights for women lead to more spending on health and children, which should benefit development. The political-economy literature on the evolution of women's rights finds that technological change increased the costs of patriarchy for men, and thus contributed to expanding women's rights. Combining these perspectives, we discuss the theory of Doepke and Tertilt (2009), where an increase in the return to human capital induces men to vote for women's rights, which in turn promotes growth in human capital and income per capita. Keywords: Women's Rights, Political Economy, Development. Discussion of this paper on the Economic Logic blog. Journal of Economic Growth, 15(1), 1-31, March 2010. Lead article. Abstract: In recent years, a number of governments and consumer groups in rich countries have tried to discourage the use of child labor in poor countries through measures such as product boycotts and the imposition of international labor standards. The purported objective of such measures is to reduce the incidence of child labor in developing countries and thereby improve children's welfare. In this paper, we examine the effects of such policies from a political-economy perspective. We show that these types of international action on child labor tend to lower domestic political support within developing countries for banning child labor. Hence, international labor standards and product boycotts may delay the ultimate eradication of child labor. Keywords: Child Labor, Political Economy, International Labor Standards, Trade Sanctions. Western Pressure Reduces Crucial Local Action to End Child Labor. Child Labor: Is International Activism the Solution or the Problem? (Published in Vox). Warum internationale Boykotte gegen Kinderarbeit die Lage eher verschlimmern als verbessern (Published in GEO, July 2010). Discussions of this paper on various blogs: Freakonomics, Economic Logic, Pixelökonom, EconoSpeak. 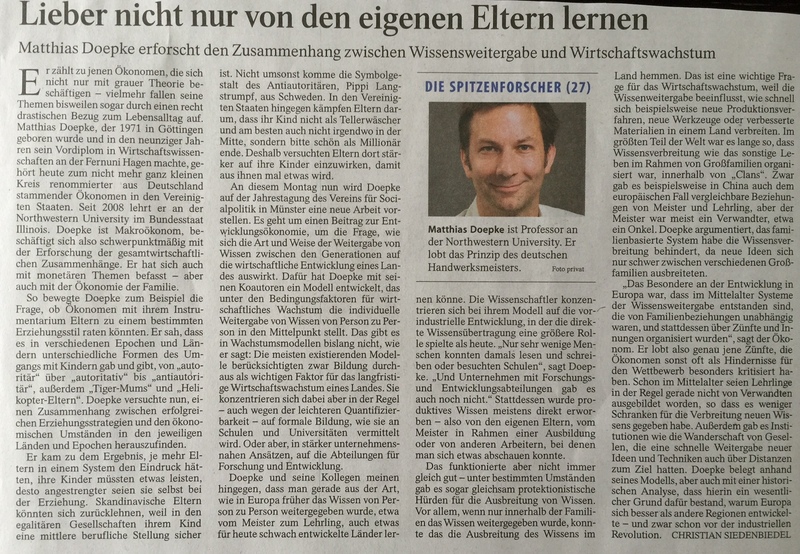 An article about this paper in Frankfurter Allgemeine Sonntagszeitung (in German): Kauft T-Shirts aus Kinderhand. Quarterly Journal of Economics, 124(4), 1541-1591, November 2009. Abstract: The nineteenth century witnessed dramatic improvements in the legal rights of married women. Given that they took place long before women gained the right to vote, these changes amounted to a voluntary renouncement of power by men. In this paper, we investigate men's incentives for sharing power with women. In our model, women's legal rights set the marital bargaining power of husbands and wives. We show that men face a tradeoff between the rights they want for their own wives (namely none) and the rights of other women in the economy. Men prefer other men's wives to have rights because men care about their own daughters and because an expansion of women's rights increases educational investments in children. We show that men may agree to relinquish some of their power once technological change increases the importance of human capital. We corroborate our argument with historical evidence on the expansion of women's rights in England and the United States. Keywords: Women's Rights, Political Economy, Human Capital, Return to Education. Women's Rights: What's in It for Men? (published in Vox). The Emergence of Women's Rights and Gender Equality. Journal of the European Economic Association, 7(2-3), 508-518, April-May 2009. Abstract: Child labor is a persistent phenomenon in many developing countries. In recent years, support has been growing among rich-country governments and consumer groups for the use of trade policies, such as product boycotts and the imposition of international labor standards, to reduce child labor in poor countries. In this paper, we discuss research on the long-run implications of such policies. In particular, we demonstrate that such measures may have the unintended side effect of lowering domestic support for banning child labor within developing countries, and thus may contribute to the persistence of the child-labor problem. Review of Economic Studies, 76(2), 597-628, April 2009. Abstract: How is the quality of public education affected by the presence of private schools for the rich? Theory and evidence suggest that the link depends crucially on the political system. We develop a theory that integrates private education and fertility decisions with voting on public schooling expenditures. We find that the presence of a large private education sector benefits public schools in a broad-based democracy where politicians are responsive to low-income families, but crowds out public-education spending in a society that is politically dominated by the rich. The main predictions of the theory are consistent with state-level and micro data from the United States as well as cross-country evidence from the PISA study. Keywords: Public Education, Private Education, Probabilistic Voting, Democracy. A non-technical summary: Politics and the Structure of Eduation Funding (published in Vox). The same in French: Financement privé de l'éducation, inégalités et démocratie. Quarterly Journal of Economics, 123(2), 747-793, May 2008. Abstract: The British Industrial Revolution triggered a reversal in the social order whereby the landed elite was replaced by industrial capitalists rising from the middle classes as the economically dominant group. Many observers have linked this transformation to the contrast in values between a hard-working and thrifty middle class and an upper class imbued with disdain for work. We propose an economic theory of preference formation in which both the divergence of attitudes across social classes and the ensuing reversal of economic fortunes are equilibrium outcomes. In our theory, parents shape their children's preferences in response to economic incentives. If financial markets are imperfect, this results in the stratification of society along occupational lines. Middle-class families in occupations that require effort, skill, and experience develop patience and work ethic, whereas upper-class families relying on rental income cultivate a refined taste for leisure. These class-specific attitudes, which are rooted in the nature of pre-industrial professions, become key determinants of success once industrialization transforms the economic landscape. Keywords: Endogenous Preferences, Social Classes, Stratification, Industrial Revolution. Plenary talk at the annual meeting of Verein für Socialpolitik 2007, published in Perspektiven der Wirtschaftspolitik, 9(3), 73-89, May 2008. Abstract: Seit Mitte der achtziger Jahre hat die neue Wachstumstheorie verstärkt Aufmerksamkeit auf Humankapital als eine Quelle des Wirtschaftswachstums gelenkt. Neuere empirische Ergebnisse weisen allerdings darauf hin, dass Bildungsinvestitionen nur geringe soziale Externalitäten erzeugen und dass der direkte Beitrag des Humankapitals zum Wirtschaftswachstum relativ gering ist. In dieser Arbeit wird der Beitrag des Humankapitals zur Wirtschaftsentwicklung im Rahmen der langfristigen Wachstumstheorie dargestellt, deren Gegenstand ist, den Übergang von Ländern von vor-industrieller Stagnation zu stetigem Wirtschaftswachstum zu erklären. Hier erweist sich, dass Humankapital nicht nur direkte Produktivitätseffekte erzeugt, sondern auch als Auslöser verschiedener entwicklungsfördernder politischer Reformen dienen kann. Entry prepared for New Palgrave Dictionary of Economics, 2nd Edition. Abstract: Following a phase of near-constant living standards lasting from Stone Age until the onset of the Industrial Revolution, a large number of countries have experienced growth takeoffs, in which stagnation gives way to sustained economic growth. What causes some countries to enter a growth takeoff, while others remain poor? We discuss three mechanisms that can trigger a growth takeoff in a country previously captured in a poverty trap: fertility decline, structural change, and accelerating technological progress. Keywords: Industrial Revolution, Demographic Transition, Structural Change. Published in Frontiers in Family Economics, edited by Peter Rupert, Emerald Press, 2008. Abstract: In this paper we investigate the positive and normative consequences of child-labor restrictions for economic aggregates and welfare. We argue that even though the laissez-faire equilibrium may be inefficient, there are usually better policies to cure these inefficiencies than the imposition of a child-labor ban. Given this finding, we investigate the potential political-economic reasons behind the emergence and persistence of child-labor legislation. Our investigation is based on a structural dynamic general equilibrium model that provides a coherent and uniform framework for our analysis. Keywords: Child Labor, Welfare, Efficiency, Political Economics. The EconomicDynamics Newsletter, 87(2), April 2007. An overview of my research on economic growth. Journal of Political Economy, 114(6), 1069-1097, December 2006. Abstract: This study quantitatively assesses the effects of inflation through changes in the value of nominal assets. It documents nominal asset positions in the United States across sectors and groups of households and estimates the wealth redistribution caused by a moderate inflation episode. The main losers from inflation are rich, old households, the major bondholders in the economy. The main winners are young, middle-class households with fixed-rate mortgage debt. Besides transferring resources from the old to the young, inflation is a boon for the government and a tax on foreigners. Lately, the amount of U.S. nominal assets held by foreigners has grown dramatically, increasing the potential for a large inflation-induced wealth transfer from foreigners to domestic households. A discussion of the paper in Region Focus. Journal of the European Economic Association, 4(2-3), 493-502, April-May 2006. Abstract: This paper shows that a zero-sum redistribution of wealth within a country can have persistent aggregate effects. Motivated by the case of an unanticipated inflation episode, we consider redistribution shocks that shift resources from old to young households. Aggregate effects arise because there are asymmetries in the reaction of winners and losers to changes in wealth. We focus on two sources of asymmetries: differences in the average age of winners and losers, and differences in their labor force status. Journal of Economic Theory 126(1), 235-285, January 2006. Abstract: We develop general recursive methods to solve for optimal contracts in dynamic principal-agent environments with hidden states and hidden actions. In our baseline model, the principal observes nothing other than transfers. Nevertheless, optimal incentive-constrained insurance can be attained. Starting from a general mechanism with arbitrary communication, randomization, full history dependence, and without restrictions on preferences or technology, we show how the optimal contract can be efficiently implemented as a recursive direct mechanism. Our methods generalize to environments with multiple actions and additional states, some of which may be observable. The key to implementing these extensions is to introduce multiple layers of off-path utility bounds. Keywords: Mechanism Design, Partial Insurance, Dynamic Contracts. American Economic Review 95(5), 1492-1524, December 2005. Abstract: We develop a positive theory of the adoption of child labor laws. Workers who compete with children in the labor market support the introduction of a child labor ban, unless their own working children provide a large fraction of family income. Fertility decisions lock agents into specific political preferences, and multiple steady states can arise. The introduction of child labor laws can be triggered by skill-biased technological change that induces parents to choose smaller families. The theory can account for the observation that in Britain regulations were first introduced after a period of rising wage inequality, and coincided with rapid fertility decline. Keywords: Child Labor, Voting, Fertility, Inequality. An earlier version of this paper circulated under the title: "Voting with your Children: A Positive Analysis of Child-Labor Laws." A static version of the model that illustrates the main ideas in a simplified framework (useful for teaching purposes). Child Mortality and Fertility Decline: Does the Barro-Becker Model Fit the Facts? Journal of Population Economics 18(2), 337-366, June 2005. Abstract: I compare the predictions of three variants of the altruistic parent model of Barro and Becker for the relationship between child mortality and fertility. In the baseline model fertility choice is continuous, and there is no uncertainty over the number of surviving children. The baseline model is contrasted to an extension with discrete fertility choice and stochastic mortality and a setup with sequential fertility choice. The quantitative predictions of the models are remarkably similar. While in each model the total fertility rate falls as child mortality declines, the number of surviving children increases. The results suggest that factors other than declining infant and child mortality are responsible for the large decline in net reproduction rates observed in industrialized countries over the last century. Keywords: Fertility, Infant Mortality, Child Mortality, Demographic Transition. Journal of the European Economic Association 3(2-3), 516-524, April-May 2005. Abstract: The British Industrial Revolution was a time of major socio-economic transformations. We review a number of recent economic theories which analyze the transition from a preindustrial world characterized by high fertility, stationary standards of living, and rigid social hierarchies to modern capitalism. One of the key social transformations that accompanied the Industrial Revolution was the economic decline of the aristocracy. Standard theories of wealth inequality cannot explain why the aristocrats, in spite of their superior wealth and education, failed to be the main protagonists and beneficiaries of industrialization. We discuss recent research based on a model of endogenous preferences that is consistent with the demise of aristocracy. Keywords: Endogenous Preferences, Industrial Revolution, Social Class. Recherches Economiques de Louvain, 71(1), 5-34, 2005. Abstract: The empirical literature on monetary policy shocks documents that contractionary shocks are followed by a persistent rise in interest rates and a persistent fall in output. Standard monetary business cycle models can account for the initial effects of monetary shocks, but have difficulty generating persistence. In this paper, I examine whether frictions that affect the asset allocation decisions of households can lead to persistent effects. In the model economy, households hold two assets, one used for transactions (the checking account) and one used for investment (the savings account). There is a small transaction cost for moving funds between the accounts. Another key feature of the economy is that the business sector accumulates retained earnings and credits profits to the consumers only with a delay. I show that in this environment monetary shocks have persistent effects even when the adjustment cost is very small. Keywords: Monetary Shocks, Retained Earnings, Persistence, Business Cycles, Flow of Funds. Journal of Economic Growth 9(3), 347-383, September 2004. Abstract: In every developed country, the economic transition from pre-industrial stagnation to modern growth was accompanied by a demographic transition from high to low fertility. Even though the overall pattern is repeated, there are large cross-country variations in the timing and speed of the demographic transition. What accounts for falling fertility during the transition to growth? To answer this question, this paper develops a unified growth model which delivers a transition from stagnation to growth, accompanied by declining fertility. The model is used to determine whether government policies that affect the opportunity cost of education can account for cross-country variations in fertility decline. Among the policies considered, education subsidies have only minor effects, while accounting for child-labor regulations is crucial. Apart from influencing fertility, the policies also have large effects on the evolution of the income distribution in the course of development. Keywords: Growth, Fertility, Demographic Transition, Education, Child Labor, Income Distribution. Journal of Development Economics 73(2), 607-629, April 2004. Abstract: We assess the merits of different education systems in a framework that accounts for the joint decision problem of parents regarding fertility and education. Specifically, we compare the implications of a public and a private schooling regime for economic growth and inequality. We find that private schooling leads to higher growth when there is little inequality in human capital endowments across families. In contrast, when inequality is high, public education yields higher growth by reducing fertility differentials. In addition, public schooling leads to income convergence, while private schooling can result in ever increasing inequality. Our analysis highlights the importance of accounting for endogenous fertility differentials when analyzing educational policies. Keywords: Growth, Inequality, Fertility, Public Education, Private Education. American Economic Review 93(4), 1091-1113, September 2003. Abstract: We develop a new theoretical link between inequality and growth. In our model, fertility and education decisions are interdependent. Poor parents decide to have many children and invest little in education. A mean-preserving spread in the income distribution increases the fertility differential between the rich and the poor, which implies that more weight gets placed on families who provide little education. Consequently, an increase in inequality lowers average education and, therefore, growth. We find that this fertility-differential effect accounts for most of the empirical relationship between inequality and growth. Keywords: Growth, Inequality, Differential Fertility, Human Capital, Education. Research papers presented on this page are based upon work supported by the National Science Foundation under grants No. SES-0217051, SES-0519265, SES-0820409, and SES-1260961.